I am getting weird colors on some games when I try to play them on the A1000. An example is Cannon Fodder and Ghosts N Gobblins. 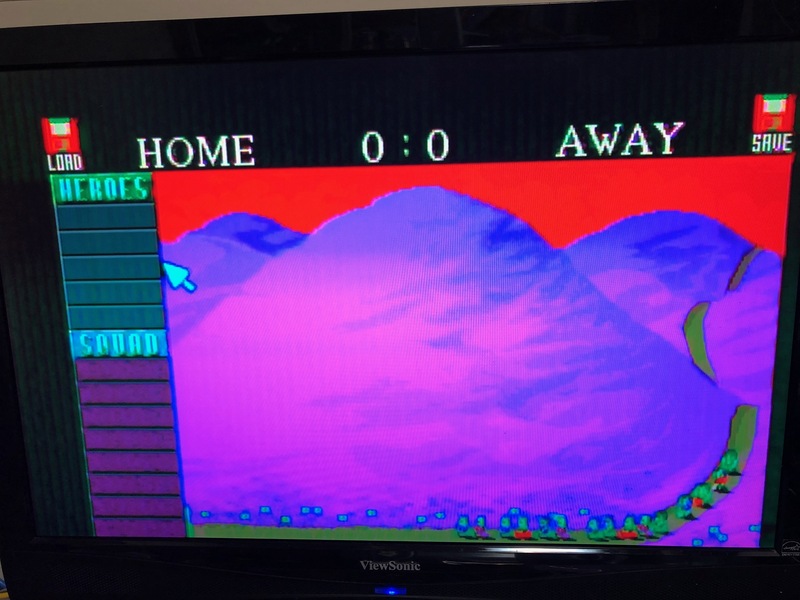 The game loads, but the colors are no right. For cannon fodder it does show ECS and OCS as supported, but the game box does not list the 1000. Is my issue that it really only supported ECS? That's an interesting question. If the only thing is colors, I'm going to guess it works on the A1000. The question is why are you seeing weird colors? Part of me wonders if it might be a PAL/NTSC thing, but that's a total guess. I don't think I have NTSC ADFs of that game handy, or I'd give it a try. I played the WHDLoad version on a 1200 last time I gave it a go. You could try in WinUAE and switch between NTSC and PAL. Tried WinUAE and it worked fine in both PAL and NTSC. Sound was sped up, but that was expected. 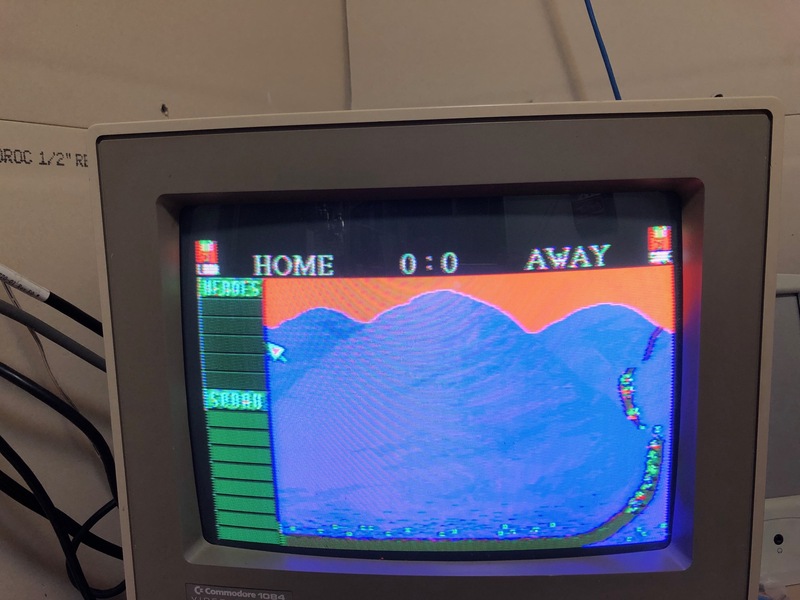 I have a commodore monitor connected to the TV Mod port and a LCD TV connected to the video port. Both show the same problem. I only have this problem in the two games so far. Looking at the pics and considering the test in WinUAE I am afraid I won’t be of much help. There was an issue with the A1000 because of the early chipset. Could as well be a part of the onboard electronics. Could be something more complex than just one chip. Only option I can see at the moment is to hope another A1000 user can try running the game and see if they get the same. At least I can narrow the issue down to hardware or not. I just started poking at this yesterday but I didn't have a lot of time to make it exhaustive for you. But I formatted a new blank disk on my 2000 and dragged over an ADF of Cannon Fodder (labelled as the UK version) for Disk 1. That alone took some time to do. I got an error at the end of the copy claiming the disk couldn't be verified or some such and the icon on the desktop showed NDOS. Then, I booted my Amiga 1000 with a Rejuvenator up with this disk in the drive. It booted just fine and marched all the way through to asking me for Disk 2. I never got to Disk 2, but for the few screens I did see everything looked totally fine. The rejuvenator I'm using has 2mb Chip and is hosting an original A3000 Agnus. Other than that, it's all the same as yours. (Well, and it has a RAM expansion, too.) The only real difference, though, is the Agnus. I should be able to make more disks later but my initial test on this machine looks fine. Remind me - is your A1000 100% stock? Do you have the front expansion RAM, Fast? Anything else or pure stock? It currently has an 8 Meg memory expansion, the rest is stock. I think the problem may be Denise. It is the early version without EHB. Trying to track down a newer version.